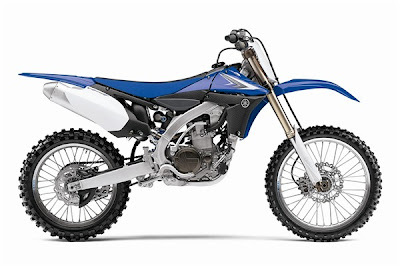 The new YZ450F is quite the deviation from the norm. The engine has been turned completely around taking air in from the front and exhausting it through the rear. It almost looks natural in a weird sort of way. Yamaha claims that this provides unmatched mass centralization among other things, but I just think it looks cool! James Stewart has already been winning races on this bike, which basically says that it's at least not a complete failure, being that Stewart is the fastest man on the planet on a dirt bike. The fuel injection provides awesome throttle response and power, but also makes this major design change possible having enough fuel economy for a smaller tank and putting the injection system where a normal carb would not fit. 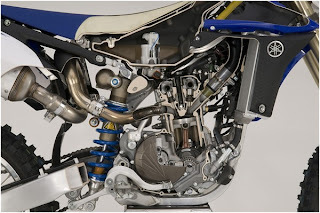 The exhaust exits the rear and makes a loop that Yamaha refers to as a "tornado style". This added length is necessary for top performance. The rear suspension was also improved upon taking advantage of the additional space left when the air box was moved to the front. The price for all this technology is around $8,000. This Yamaha is really an awesome piece of engineering. It does make a lot more sense to run inlet and exhaust in this fashion, and I do expect to see the other manufacturers follow suit with future model design. Fuel injection really makes life goooood! I would love to tard one of these!